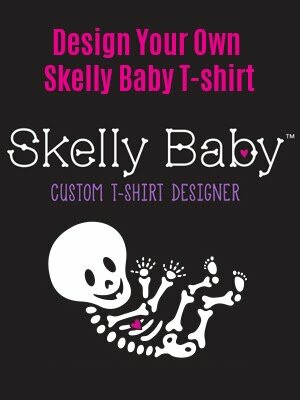 I've wanted to do some blog posts on the baby skelee shirts that have been a popular seller for me since 2008. I'm starting with the original Maternity Skeleton T-shirt which also comes in gender versions: girl with bow, and boy with hat (added this spring). This design evolved last year to include a heart for the baby too. (I get my best ideas from my customers!) It was by customer request that I added the twins maternity shirts, and then the next year, the triplets. 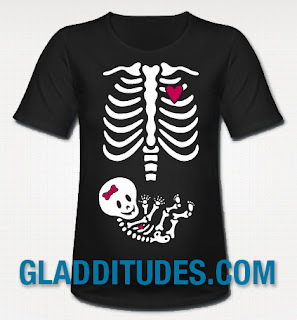 There is even a version of the Maternity X-ray shirt that is for women with situs inversus (internal organs flopped). This year I dedicated an entire page on my website to the different Maternity Xray versions. I also retooled my European T-shirt site, adding my newer designs -- I had to make "Mom" into "Mum" on the tattoo shirt and I'm currently working on a fish and chips Daddy shirt, since pizza and beer do not translate very well across the pond! I added a special category in my online T-shirt Designer where customers have access to the different skelee designs and can customize their own shirt. In that category I have some designs that include the whole skelee design (ribcage and baby), which is usually two designs combined. This allows for some cost cutting options. The combined versions have a max height of 15 inches, so the design is a little smaller than the original version, which is around 18" tall. Gladditudes shirts are made when ordered, allowing for customization. The shirts are printed with cut vinyl which is heat pressed into the shirt. There can be up to three colors per design. I offer versions such as the glow-in-the-dark Maternity Halloween T-shirt that are all one color, cutting down a bit on the cost by eliminating extra colors. Here is a value priced non-maternity shirt version of the glow-in-the-dark skeleton shirt on a mens/unisex t shirt. The maternity shirt design has evolved too. My shirt fulfillment company last year introduced their own custom-made maternity shirt. It has a body-hugging, stretchy fit with a round neck. It is fairly long to accommodate different heights and belly sizes. Many of my customers prefer to purchase a non-maternity shirt, since they plan to wear it earlier in their pregnancy. The designs also come on a plus size t shirt and men's shirts for those that want a roomier and longer fit. A note to sellers -- the ribcage and baby skelee that make up the Maternity Skeleton X-ray design are copyrighted by Gladditudes and cannot be copied and sold without written permission. Gladditudes owns the copyright simply by the act of publishing original art (according to U.S. copyright laws), but does have an official copyright: VA 1-835-531, which also covers derivative works. As of now (2013) I have given exclusive U.S. licensing reproduction rights for iron-on transfers to only one company in the U.S. -- but for finished t-shirts, this design is only to be sold on the Gladditudes websites, and Spreadshirt's U.S. and EU websites (with my permission). © Gladditudes 2008-2013. All rights reserved.